Open Range is a Kevin Costner movie and a pleasant surprise. It seems like a millennia since he's made anything that didn't fall off the screen and flop around on the floor like a slowly suffocating trout, destined only for an elderly man's dinner plate tomorrow night at Long John Silvers. Open Range though, fits Costner's on screen sensibilities like a glove, making him seem as if he were born to play a craggy faced cowboy and nothing else. Yes, Open Range is a Western, something scarce in a modern cinema world of bad cop dramas and stereotyped comedies. Unlike this summer's huge hit, Pirates of the Caribbean, which also took on a somewhat dead genre, Open Range isn't likely to bring about a revitalization of the Hollywood Western. What it does do is bring one of the most crystal clear recreations of the period to absolutely stunning life, complete with lively characterizations and all the usual Old West, revenge-bent cliche's. 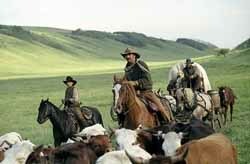 Opening with a beautiful and irresistibly realistic portrayal of trail riding life, Open Range goes out of its way to bring depth to the cowpoke world of its aging lead characters Boss Spearman (Robert Duvall) and Charley Wait (Kevin Costner). Some might call the opening overlong, but I found it impossible to turn away from, a slow and deliberate peek into the true world of the oft glossed over cowboy legend. Together with their two helpers, Charlie and the Boss travel the prairies of the Old West herding cattle from one place to another, living off the land with no one for company but each other. Hey! It's Larry Kubiak! He's playing Mose, one of Boss Spearman's hands, and a big hulk of an actor who never seems to get enough respect. Sadly, times are changing. Ranching has taken hold and the world has quickly grown too small for their brand of free range cattle raising. So, as in any good western, trouble finds them, when a free-grazer hating rancher refuses to let them pass through his town. The typically greedy rancher raids the free-ranger camp, murdering and injuring their young hands. Boss takes it personal and together he and Charley set out to seek revenge and set things right in a town all but held hostage. What sets Open Range apart from the hundreds of other genre favorites that have come before it isn't its story, which in general terms, seems to cover all the same basics you'd expect from any classic Western. But there's an element of realism here that I can't recall feeling so strongly in any similar film. 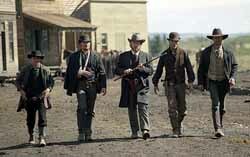 Costner in particular cuts a striking 19th century figure, flashing guns and stoicism, while attempting to come to grips with misdeeds of the past. 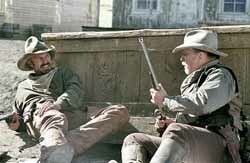 Character developing moments between Costner and Duvall, are unmistakably the highlights of Open Range, their interplay coming easy and slow, with a sometimes humorous and sometimes touching chemistry that would normally seem impossible to achieve with two such staunchly stoic characters. What was most surprising to me is that in among all this seriousness and drama, Costner and Duvall also manage to make this a fairly funny film. They do so, without taking away from the intensity of the subject matter... maybe that's only possible when you have this kind of perfect chemistry between two such veteran actors. Eventually things get very out of hand, and Open Range delivers a classic gunfight, filling in the genre's revenge-bent need on every level. Here, as in every aspect of the film, the cinematography and strikingly sharp sound effects of gunfire, thunder, and rain are simply gorgeous. Defending a town may be old hat, but under Costner's directorial hand it looks decidedly fresh and renewed. Violence is used, but with regret. Once Costner's character turns it on though, he has a hard time turning it off. What stood out for me was the way he telegraphed his emotions through body language rather than expression. Even though Charley's face remains carefully blank, his movements scream of anger and hate as he coolly defends the woman he loves. The only serious flaw facing Open Range is the somewhat overextended romance between Costner and Bening. Initially it serves the wonderful purpose of bringing something new to Costner's character, but in the end tends to be drawn out a little too long, giving the movie a somewhat unwieldy and uncertain feel. This is admittedly a nitpick, but one that weighs things down at all the wrong moments, just when things should be wrapping up. Open Range proves itself one of the most picturesque and enjoyable stints of the summer. This is Costner's third stop behind the director's chair and the one where he proves it wasn't a fluke; he may actually know what he's doing there. Most impressive is that he does it without shoving his personally affinity for Old West minutiae down our throats and without weighing the flick down in an avalanche of Americana. Coming out as it does, amidst the final flush of summer movie-making, Open Range may not be able to revitalize the Old West genre or even Costner's career... but it should.